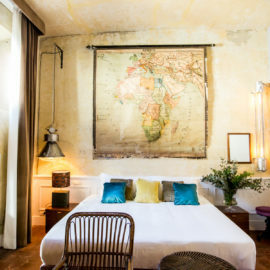 Spread over the top two floors of an 18th century palazzo connected by an internal spiral staircase, the 14 rooms overlook a peaceful internal courtyard or look out onto the historic Via Dei Serragli. Every room has a different look and feel where original features live side by side with contemporary iconic furniture and eclectic details. All rooms are stocked with a kettle and espresso machine, HD TV, free wi –fi and C.O. Bigelow bath products and slippers. 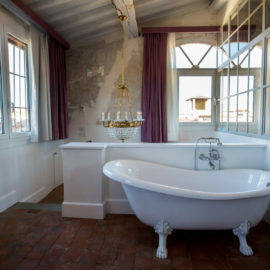 Some rooms also have a freestanding bathtub in the bedroom as well as a shower in the bathroom.